In Russia, tomorrow is Cosmonautics Day in honor of the first human in space, Yuri Gagarin. 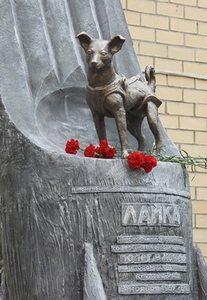 This year will be different because Laika the dog and the first living creature to orbit the Earth is being honored with a monument in Russia at the site of the facility where pre-flight preparations were handled. Over 50 years ago, Sputnik 2 carried Laika into space. Laika was a small stray dog who, along with several other strays, was used by the U.S.S.R. space program in the 1950’s. Due to the rush to get Sputnik 2 in space, there was no time to design a re-entry capsule, so sadly Laika was doomed. Check out the earlier post about Laika on the 50th anniversary of her flight into space—there are links to more information on Laika, to original newsreel footage, the original New York Times article from 1957, and to a contemporary graphic novel about Laika by Nick Abadzis.